Let’s clear something up right off the bat – very few members of the Cleveland Cavaliers have been playing well so far in the NBA Finals. You don’t lose two games by a combined 41 points without a lot of guys under-performing. Such is the case for the Cavs. Outside of LeBron James and Kevin Love, Cleveland hasn’t received much from the rest of the roster in two blowout losses to the Golden State Warriors. You can essentially point anywhere in the locker room and find a player who’s struggling this series. Kyrie Irving has had his moments, but was sloppy and lethargic more often than not in Games 1 and 2. His backup, Deron Williams, has yet to score a single point on nine shots and looks just plain old on the court. While Iman Shumpert‘s defense helped out in Game 2, the same can’t be said for his offense (six points on 1-6 shooting). 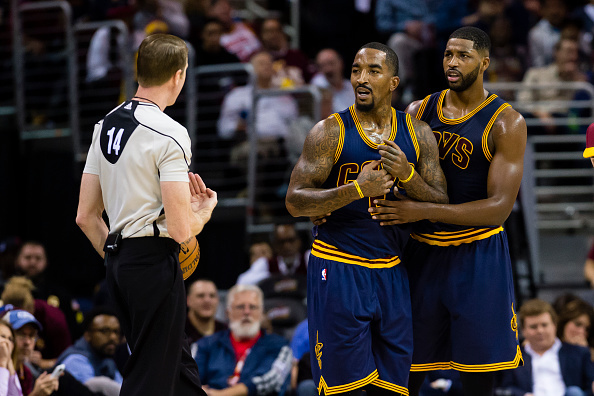 All the aforementioned issues have helped put the Cavs in a dire predicament. Game 3 in Cleveland is nothing short of a must-win situation, as another loss would all but finish this series. In finding the biggest culprits behind the Cavs’ current struggles, though, you don’t have to look much further than Tristan Thompson and J.R. Smith. Both starters are seen as important contributors when it comes to Cleveland’s title hopes, and both have been absolutely putrid so far. For what it’s worth, Smith actually netted the first points of the Finals, potting a three in the early minutes of Game 1. Problem is, he hasn’t scored since. Smith only took three more shots in the opening game despite playing 28 minutes. While Cleveland doesn’t count on him for 20 points a night, the team definitely needs more from him offensively. Up until this series, Smith had also surprisingly become one of the Cavs’ top defenders. By midway through the playoffs, Cleveland had him guarding the opponent’s top players. This, of course, prevented James from having to exert as much energy on defense, allowing him to average around 30 PPG on his way to the Finals. In the first two games of this series, though, Smith has been a ghost defensively. Granted, having to cover Steph Curry or Klay Thompson is no easy task. Still, if Smith isn’t providing anything on the scoreboard, he at the very least needs to contribute on the other end of the court. Right now, this isn’t happening. That said, if there’s anyone on Cleveland’s roster who’s been a bigger letdown than Smith, it’s Thompson. Seen by many as the Cavs’ spark plug, Thompson was a shell of himself in Games 1 and 2. Though the team doesn’t lean on him as much for his offense, you’d like to think it expects more than the eight points he’s provided, all of which came Sunday night. More concerning, though, is his struggles in the one department he truly excels at – rebounding. In two games, Thompson has eight rebounds. Not per game, total. This fact alone is concerning. That Curry has collected twice as many boards is borderline embarrassing. Top it off with the fact Thompson’s defense has left a lot to be desired, and you have a player failing to bring his best qualities to the table. He posted a -13 plus/minus in Game 1, followed by a -18 in Game 2. The constant energy he typically uses to frustrate opponents has been absent all series long. Both Thompson and Smith playing this poorly is a big reason why the Cavs have their backs against the wall. That they’re both relied on as starters only exacerbates this fact. While James’ continued dominance and Irving cleaning up his game will both help Cleveland’s attempts to get back into this series, the team also badly needs Smith and Thompson to wake up. Without the former’s potent scoring ability, the Cavs are struggling to keep up with Golden State’s firepower. Without the latter contributing on the boards, Cleveland’s possessions are far too often one and done. The Cavs will always go as far as the Big Three takes them. However, if James, Irving and Love aren’t getting support – especially from their two fellow starters – it makes their job near-impossible. Right now, Thompson and Smith haven’t provided said support. Instead, they’re weighing their team down. If this doesn’t change in Game 3, Cleveland’s summer vacation is going to start far earlier than planned.